We are getting ready for our next trip in the RV. In the meantime, I thought I would share a couple of pictures our daughter, Katie, took with her telescope from her back yard. 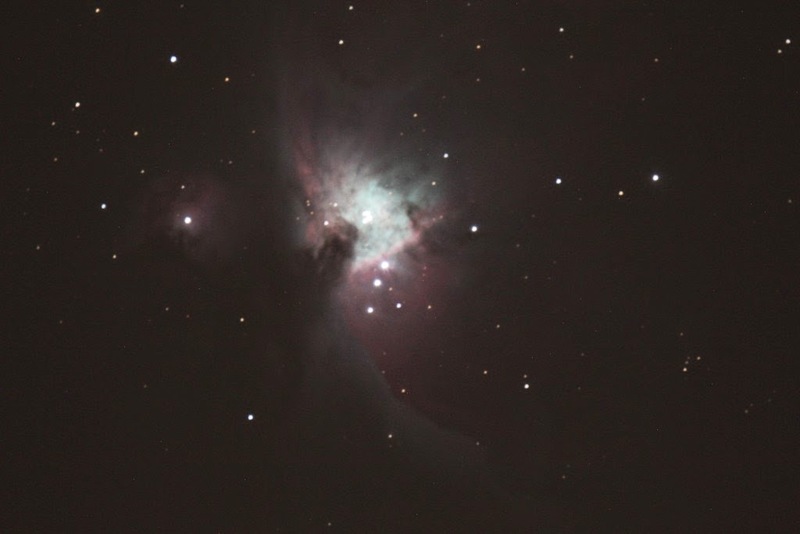 These are of Orion's Nebula. 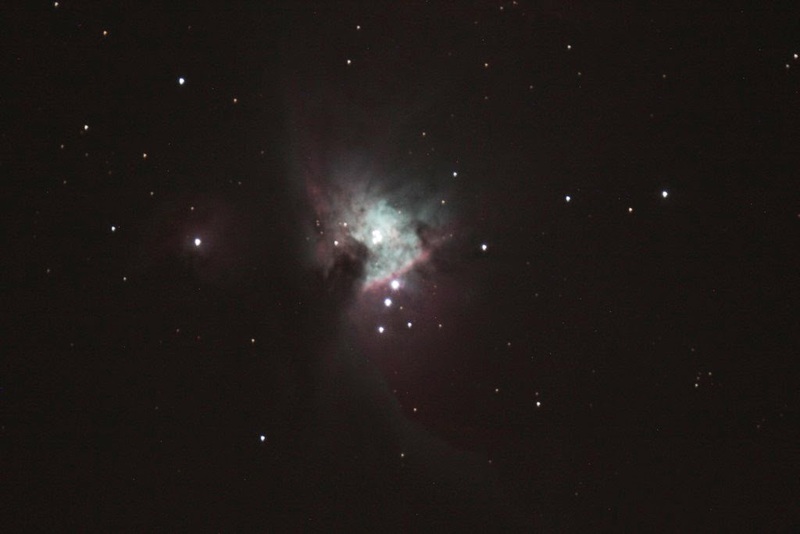 In the case of Orion's Nebula, it is a gas and dust cloud illuminated by lots of stars that are young. It is like a star nursery, so the gas and dust and other processes are leading to the birth of a new star. Other Nebula are formed when a star dies and ejects its outer layer of gas. It is an amazing part of our existence most of us barely understand! 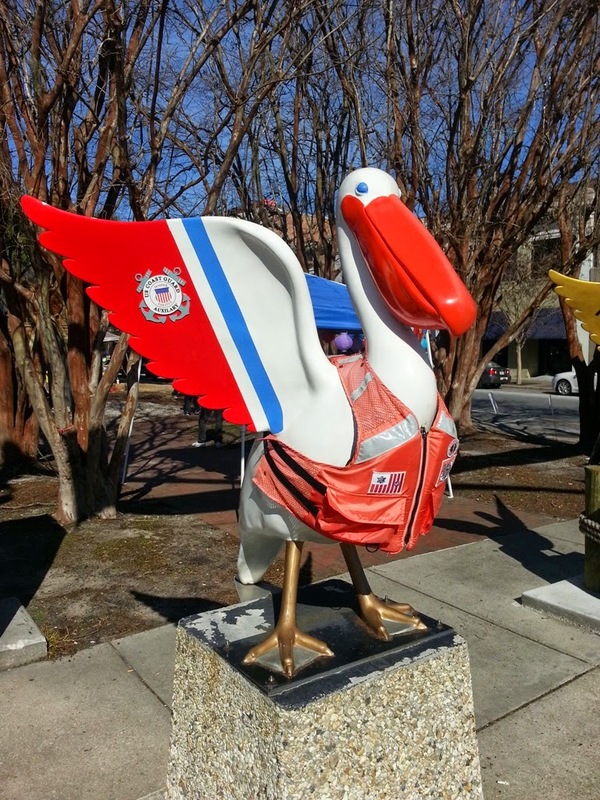 And now down to earth, we went to Pensacola and finally got a good picture of my pelican! Our final stop on the cruise was Labadee, which is located on the north coast of Haiti. This is a private area controlled by RCCL. It consists of several beaches and buildings to accommodate cruise passengers for a day at the beach. The ship docks at the company pier and it is a very short walk to the attractions. For those who did not wish to walk the modest distances involved could take a tram. A ship's lunch buffet was provided ashore. Plenty of beach chairs were available. One of the big attractions was the zip line from the hill top over the ocean. It claims to be the highest over water zip line in the Caribbean. It was very busy all day and we enjoyed watching folks fly by while we sat on the beach. The charge for the zip line that lasted about 1 minute was $100. We decided to give it a pass. You could also charter various boats for exploring the area, fishing, what have you. We chose to wander and relax on the beach(es). Lots of vendors were willing to sell you local handcrafted items. We did pick up some hand carved items from the artist hall. The outdoor vendors were very pushy and we chose to avoid them. Curacao is the third of the Dutch Antilles Islands that visited. Its early European history is similar to Bonaire. In the 2010 elections, it voted to become independent from the Netherlands. It is a much larger island with a population of over 150,000 people. Our interest here was in visiting the capital city, Willemstad, which is a designated world heritage site. So we spent our time here exploring this historic city. It was founded by the Dutch in the mid 1600's and quickly made it a slave trading center. Today it is a booming tourist center which has preserved much of its historic buildings. We docked in front of the RIF fort across the harbor from the old city. We strolled along the waterfront through the fort and had great view of the old city before crossing the pontoon bridge into the historic district. The buildings are well preserved and used for the commerce. Many date from the early to mid 1700's. There are plenty of places to shop and dine. As you walk along the waterfront street, you will come to a small canal that holds a floating market that has existed for centuries. Here you can buy fresh fish, fresh vegetables and assorted other items. The city streets are narrow and filled with shops and restaurants. I found one group of tourists who were all posing for a selfie along the busy streets. There is a park dedicated in 1930 to Dutch Queen Wilhelmina for her 50th birthday. Also in the park is a large DUSHI sign. In Curacao, this means sweet/nice. It would seem that this applies to US, as well. We next visited the Fort Amsterdam complex, which was the seat of the colonial government which included the Governor's mansion and the Fort Church. We were able to tour the church and museum. The church was completed in 1771, despite the date of 1769 on the building. Some of the original pieces remain in the church or the church museum which is located above the water cistern in the church. The mechanical works for the original clock tower made in Holland in 1766 can be viewed. In 1864, the English took control of the town for a short period, and Capt Bligh of the British Navy bombarded the town from the location where our ship was currently moored. There remains a cannonball in the front wall of the church that was fired during that bombardment. This is definitely a must visit city.